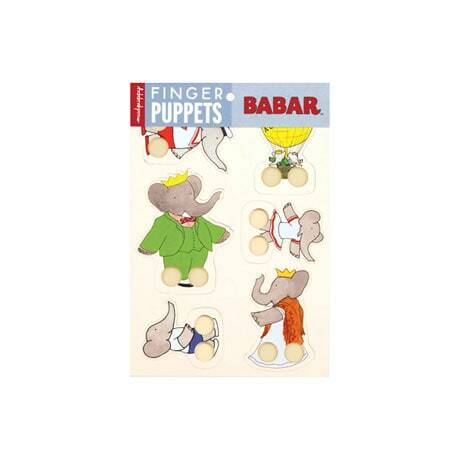 Invent your own adventures for the king of the elephants and his family with this set of Babar finger puppets, modeled on Jean de Brunhoff's original characters. Here are Babar himself, Queen Celeste, Cousin Arthur, and the children Pom and Flora, as well as Babar and Celeste's honeymoon balloon. Perfect for party favors, group storytelling activities, and imaginative play any day, these die-cut finger puppets for youngsters 4 to 8 are made of durable laminated cardboard, colorfully printed on both sides; just put your fingers through the legs holes to make them walk, dance, or caper across the play space. The puppets measure about 4½ to 5 inches tall.